Continuing on my journey of cooking through the popular steakhouse cuts of beef every steak lover should know. I’ve tackled the tenderloin, T-bone, and now onto the ribeye. 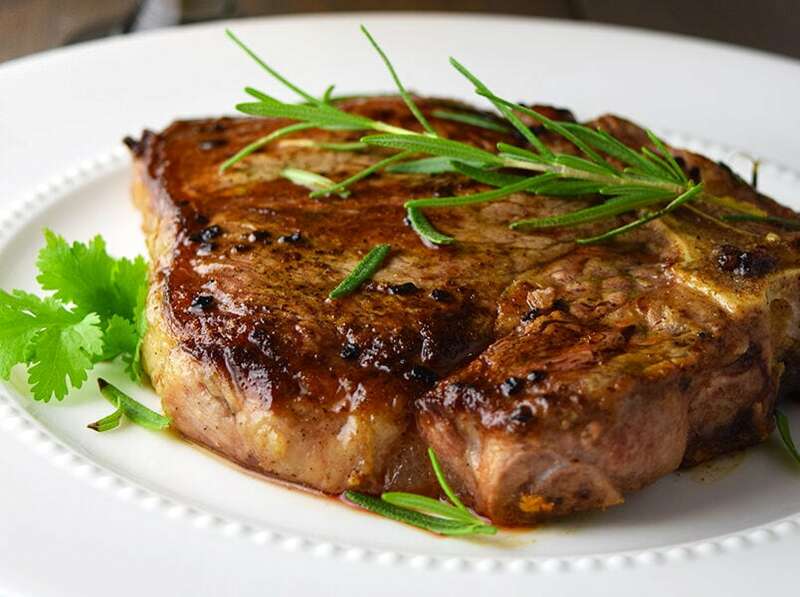 The pan-seared ribeye steak has loads of flavor. 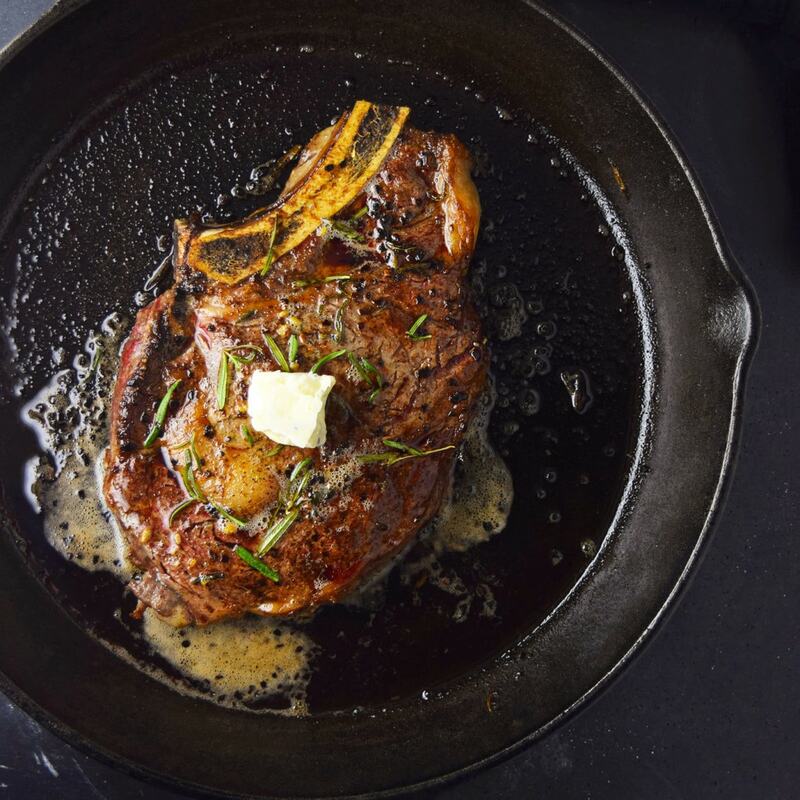 The ribeye, also known as the delmonico or cowboy steak, tends to be a fattier cut with marbling throughout. The fat contributes to the flavor and juiciness, making it the most flavorful cut of beef I’ve prepared so far. 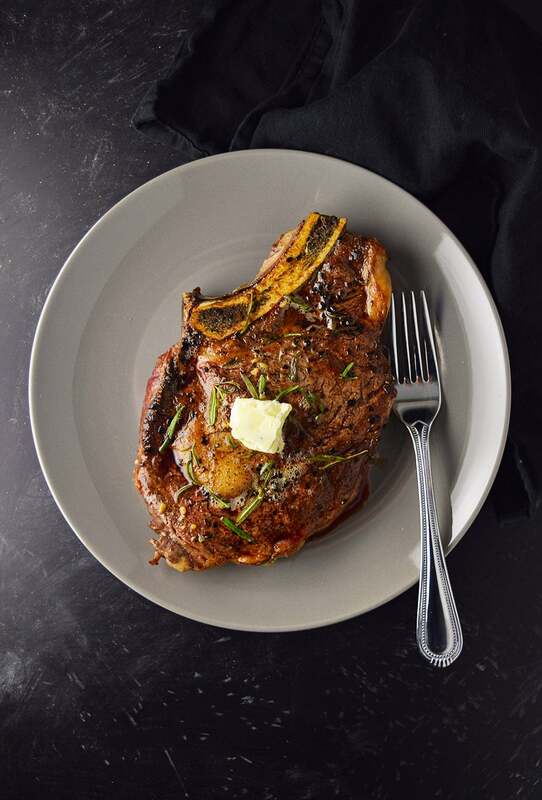 Always buy bone-in ribeye—the bone adds flavor and contains the juices when cooking. The blue cheese compound butter is easy to prepare and out of this world. 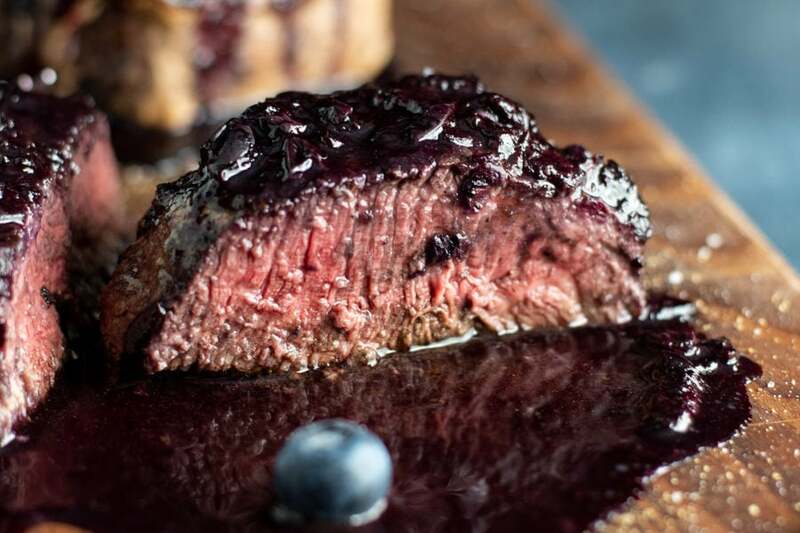 Garlic, butter, and crumbled blue cheese melted together for the perfect steak finish. It really is phenomenal. I’ve said it once so I’ll say it again. The only way to prepare steak is in a cast iron skillet. 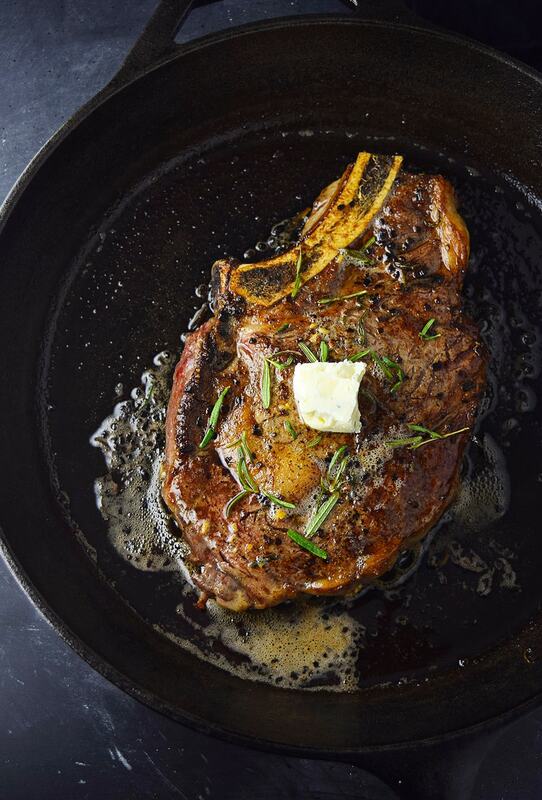 The secret lies in combining pan searing with an oven finish. This gives your steak a caramelized outside with a juicy tender inside. The oven is better at providing indirect heat while searing gives you the grilled and slightly charred edge. The other major advantage is you can cook within flavors such as garlic, butter, or fresh herbs. You can’t do this on a grill. Pan sear ribeye steak for 2 minutes per side on the stove top in a cast iron skillet with butter, and immediately transfer to preheated oven at 415° F. I typically bake about 6 minutes for medium rare. Today, you are the steak expert. 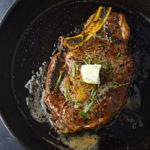 Pan searing is the easiest and most consistent way to prepare steak. If you stick to cook times and monitor temperature carefully, your steak will always come out perfect. I came across your website last week and it inspired me to buy a cast iron grill. I just finished making the rib eye steak and absolutely loved your recipe! The color inside came out a perfect medium-rare. I just wanted to say thank you and looking forward to experiencing more of your recipes. Awesome Gary – Glad it worked out well for you. You are going to love your cast iron skillet. It’s such a great tool to have in the kitchen. Thanks for dropping in. I bought a small cast iron skillet with ridges. I soaked my ribeye in oil, garlic, salt and pepper. When I grilled it on top of the stove it came out perfectly ! Best steak I’ve ever made ! Wow that sounds delicious. I’m not huge on overpowering marinades for steaks but that sounds like just the right touch ?? 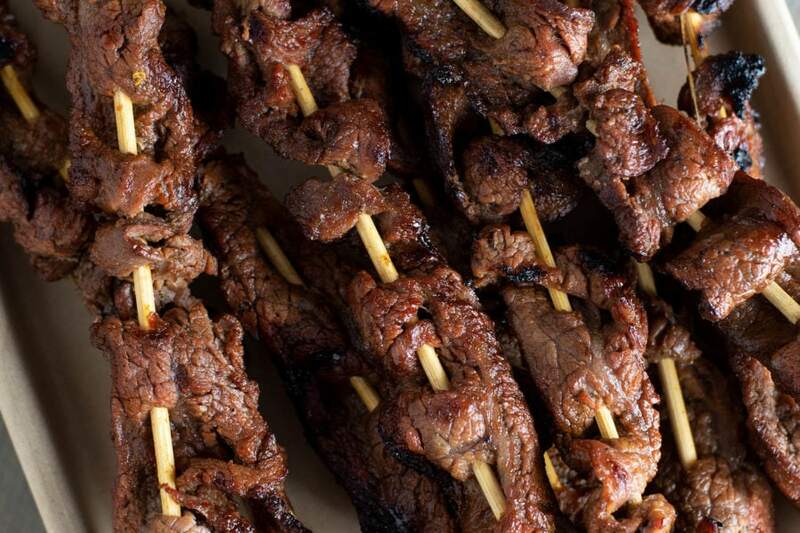 Did you marinate for a couple hours before searing? I personally don’t marinate any of my steaks (except steak tips). I prefer the natural herbs and flavors. Salt and pepper is all I use aside from the blue cheese butter in this recipe. We love this recipe. It is actually quick and easy. We have been using smaller steaks and cutting the time on the stove top to a minute thirty seconds. To make it surf and turf, we have been smoking crab legs. One day we might try some vegetables, too. Okay, probably not vegetables. Thanks for such an easy, quick, awesome steak recipe. Great idea – we’ve made the filet recipe with lobster tails for surf and turf. Awesome combo! Thanks for the note and I’ll support your no vegetables clause. Did you try printing this page? http://kitchenswagger.com/easyrecipe-print/2969-0/ It won’t print on click, it just shows a printer ready version. Press print from the link above using your browser. Awesome – glad to know parmesan works as well. When you say a half a stick of butter do you mean a whole stick of butter which is a half a cup? Or did you mean a half a stick? Half a stick of butter. I’ve used your method twice, and I can honestly say I see no need for ever grilling a steak again. All of your timing and techniques are on point. Thanks for sharing! My wife n I both like blue cheese, we enjoy grilling, along with a glass of Merlot. Awesome Clark! A nice red will never disappoint with a swagger method steak! Thanks, this is a great, simple and delicious recipe! Didn’t have blue cheese so used fresh feta with rosemary + other herbs from garden, also tasty. Husband a fan too. OMG made this tonight and my husband said I hit it out of the park. Steaks are usually his department but trusted me tonight! Thank you for the share, will definitely be in our rotation! AWESOME! Glad this worked out for you, Patsy. My GOD! I want to lick the screen! I would like to hear your opinion about cooking an steak in a stainless steel pan? Just curiosity. Been doing something like this for a while now, but I do the whole thing out on my gas grill… When it’s too hot here in San Diego (like now) I fire up the grill, and leave my cast iron skillet on it until its screaming hot, then flip the butter into it, give a a couple seconds to flare up, and toss in the steak. A couple minutes on each side, then add the rosemary, just turn the grill off, and put the cover down, and leave it for about 5 minutes more. Found it works best with a 1 1/2 – 2″ thick ribeye, or a single rib Prime rib. Awsome. Thanks! This is a beautful photo! I love this recipe. I love a good steak! Can I cook two steaks in the pan or should o do it one at a time? If you can fit two go for it! Just note it could take more time if totally filling the cooking surface. It sure how big your ribeyes are. Perfect – the first time I had it was at a steakhouse, so I had to figure out a good recipe for it! How do you prepare 4 steaks so they all finish at the same time with only one pan? Thanks for this tip — I’ve used this recipe and your filet mignon and I now use it for pretty much all steak cuts and lamb chops also. People LOVE LOVE LOVE it. I don’t red meat (ha!) but your method has the rest of the crew raving. Thanks for making me look good! No. Thank YOU Amy. Sounds like you got some real swagger. OMG, you are amazing. I made this last night with two steaks for myself and my husband. He said it was the best steak he has ever tasted. I made it exactly to the recipe. I’m sure he’ll want it again tonight. Thank you for sharing this amazingly yummy recipe. It made me look like a professional chef lol. Thank you Pamela – so glad this worked out. Sounds like YOU are the amazing one. It’s a world class steak! I’ve been doing this for a few years and have been told by world travelers that they are embarrassed about how much they’ve paid for steaks that weren’t as good as mine. I primarily use a charcoal grill with cast iron plate over the coals but any heat source using this method will produce great results. Season the steak to your preference. I have a method for making steaks more tender but that’s for another post. Skillet steak is no mistake, it’s the best way to go! so good! Don’t think we will grill another steak again, thanks for the tip! Will look for iron pan and use it! Now, I don’t know why, but I don’t like rosemary. I love the scent, which is all over my garden, but not on beef. What’s a great substitute? Basil, Mint? Thank you! I would try parsley or tarragon! Mint and basil probably wouldn’t go well with steak. Looks so delicious. I don’t really like blue cheese. What can I substitute. I see someone used parmesan, but that doesn’t do it for me. I may skip the cheese altogether, if I were you, and just use an herb butter instead. Just made this recipe for my husband who’s home from a business training that lasted a month. This was a hit out of the park! He said it was the best steak he has ever had in his life! Made it with shrimp linguine with pesto cream sauce. First time I made this it came out perfect second time my house filled up with smoke and the alarms went off, what went wrong? ? Cooking with cast iron tends to get a little smokey – you did nothing wrong. Try turning down the heat a tad and open the windows before searing. Oki have a question. How do you not keep the butter from burning and filling your house with smoke on high hear i heated my skillet on high added my butter and olive oil and promptly burned it ? Just confused. Really great except for the way it smoked up the entire common area of the house! Coughing. Eyes watering, friends leaving for the bedroom….. but extra delicious!!!! Will do it again!!! !